December « 2014 « Ka'u Rural Health Community Association, Inc.
For the entire story and pictures, click link below. A brief story is below. 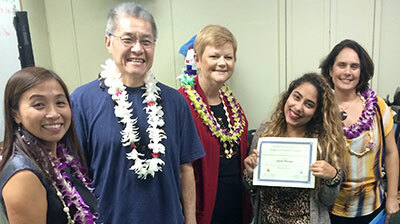 Graduation day for 15 students who completed the Individualized Career Achievement Network or iCAN program run by Kapiʻolani Community College in partnership with the McKinley Community School for Adults. The free, fast track career training program attracts a wide variety of students. This group of graduates is made up of 10 women and 5 men, who range in age from 18 to 74. “I recently came out of jail in February and ever since then, I just been on a straight path, just trying to change my life,” said fellow iCAN graduateNathan Paoa. iCAN’s mission is to help participants improve their lives by finding career pathways, whether that’s college or some type of workforce training. “We realize that students don’t have the basic skills that sometimes they need to get into those career pathways or to find the jobs that they are looking for,” said Roya Dennis, the Kapiʻolani Community College iCAN coordinator. The 135-hour program focuses on career skills like teamwork and communication along with reading, writing, math, computer skills and a broad range of support services. The students also tour college campuses. The iCAN program is a gateway to the world of possibility—a bridge to higher education or a fulfilling career. McKinley Community School for Adults and Waipahu Community School for Adults are piloting the iCAN program in a partnership between the University of Hawaiʻi Community Colleges and Department of Education Community School for Adults. It’s part of the Community College Career Training program funded by a $24.6 million grant from the U.S. Department of Labor’s Employment and Training Administration. At every iCAN graduation ceremony, each student gives a presentation on their career goals and how they will accomplish those goals. A big part of iCAN is to leave with a detailed plan. 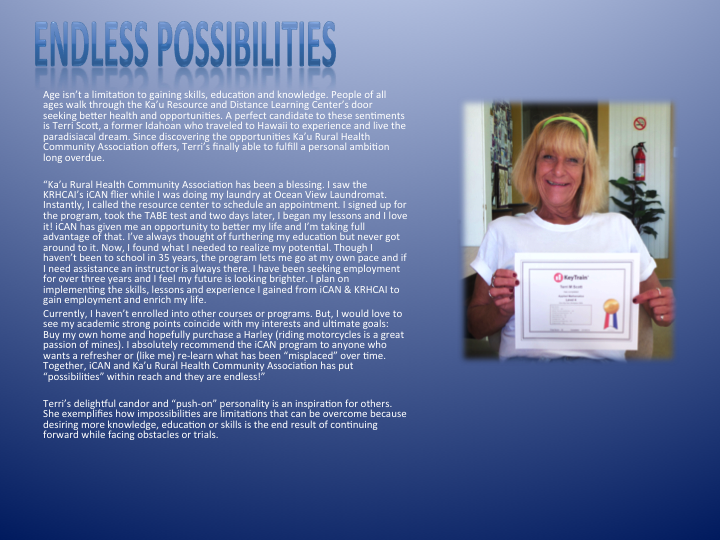 The iCAN program is available every spring, summer and fall. Graduates receive a National Career Readiness Certificate and a Certificate of Professional Development. They also have an option to earn a Healthcare Foundation certificate by taking an additional 30-hour course that covers the skills needed for entry-level positions in the healthcare industry. Just like any graduation ceremony, there are a lot of laughter, tears, hugs and one last group shot. The 4th Annual Ka’u Floating Lantern Celebration at Punalu’u Black Sand Beach Park’s “Medicine Pond” was enjoyed by Ka’u families including mainland and foreign visitors.